Stretching from the Equator in the north to the edges of Antarctica in the south, South America is a vast continent that boasts the world’s largest rainforest, its largest driest desert (Atacama desert), and its longest mountain range (the Andes). The huge range of temperatures and geographical features supports a continent teeming with a tremendous variety of flora and fauna. The South American continent is a veritable paradise for bird watchers, who can gaze upon indigenous species of waved Albatross in the Galapagos, watch Penguin chicks hatching near the edges of Argentina, and spot huge clusters of pink Flamingos in Bolivia. Millions of years of isolation from the mainland has given rise to a very unique abundance of wildlife in the Galapagos islands, firs made famous as the place where Charles Darwin theorized his historic ‘On the Origin of Species’. 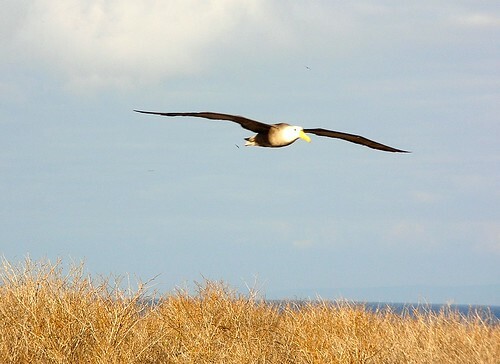 The Waved Albatross is the largest bird in the Galapagos. With a wingspan of 7-8 feet, it is a dominating presence in the skies of the islands. This bird is characterised by a yellowish-white neck that sits atop a brownish body, and a strikingly large and yellow beak. The birds breed only on the Espanola island, and they mate for life. At a depth of 13,650 feet, the Colca Canyon of Peru is almost twice as deep as the Grand Canyon in the USA. 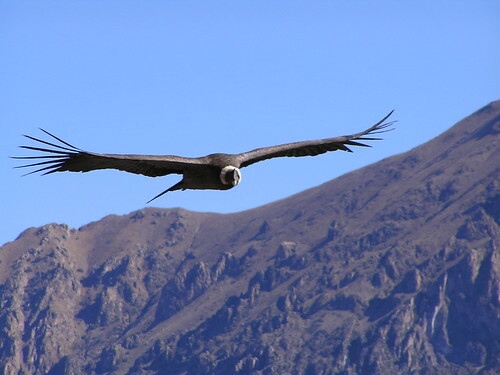 This natural wonder is also home to the famous Andean Condor, which, at nearly 10.5 feet long, possesses the largest wingspan of any bird in the world. The Andean Condor occupies a special place in local culture, history and mythology, and has been the subject of an intense conservation effort in the past two decades. These birds are threatened by extinction and sightings are difficult, although spotting the one in full flight is a sight few can ever forget. 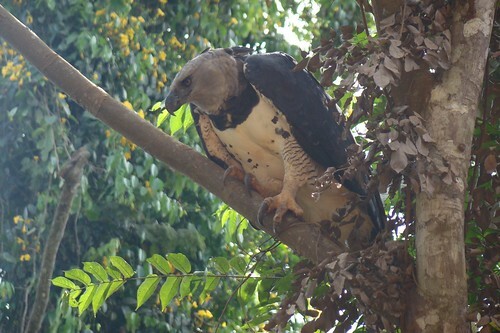 The Harpy Eagle is the largest bird of the raptor family in the Americas. Its largest concentration can be found in the rainforests of Panama, where it is also the national bird. With a wingspan of 6 to 7 feet, the Harpy Eagle is a magnificent presence in the sky. The distinctive white plumage of the birds makes them easy to identify, even from a distance. Tiourists can travel to the Panamanian jungle on specially guided tours to watch these majestic birds in their dwindling natural habitat. The Bolivian Altiplano is the highest range of high plateau in the world after Tibet. The southern reaches of the Altiplano is home to a huge concentration of Flamingo filled lakes, which are brushed pink with the brilliant plumage of the birds. The Andean Altiplano plays host to both the Andean Flamingo, and the James’ Flamingo, both of which migrate to its many lakes in the winter season. Human interaction and a loss of habitat has placed the Andean Flamingo under threat, so bird fans are advised to get their sightings in now while there are some still around. The southern edges of South America are home to the Magellanic Penguin, a smaller penguin species that survives in the relatively warmer climates of Argentina, southern Chile and the Falkland Islands. 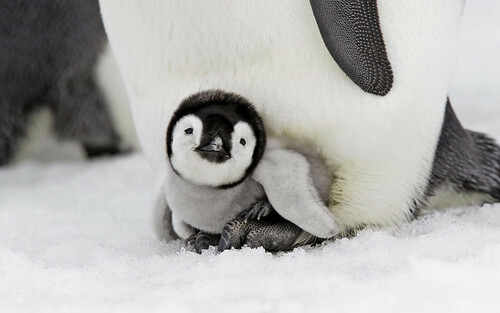 Further south, as the continent tips into the Antarctic, one can encounter the famous Emperor Penguins. Every year, thousands of tourists throng the southern coast of Argentina to witness Magellanic chicks hatching, and take a further trip down south to Antarctica to look at Emperor penguin chicks being born. Endemic species of macaws, waved Albatrosses, penguins, eagles and vultures make South America a must-stop for every bird lover! This article was brought to you by Journey Latin Ameica – a leading UK Galapagos tours operator, with decades of experience in South America.